Storm and wastewater from the settlements on the hillside of the volcanic mountains will be collected and treated at Quebradora Water Park. 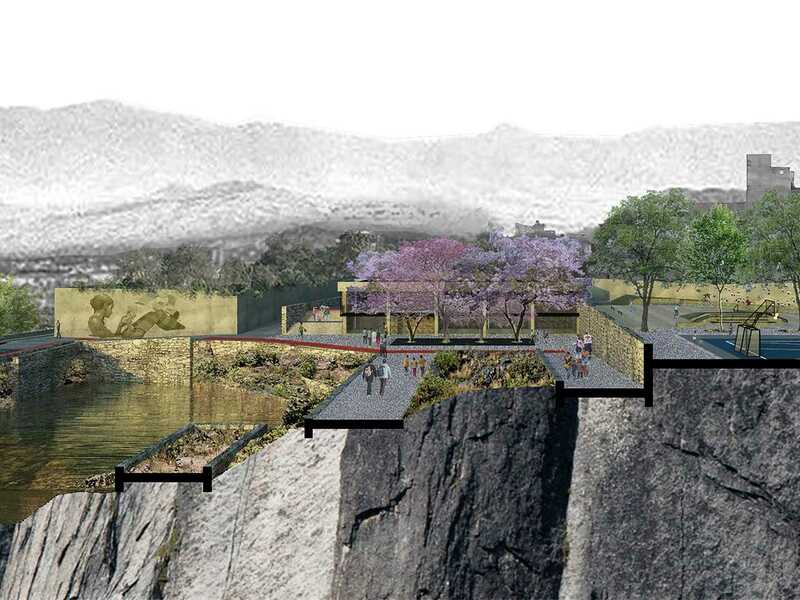 Located on the hillside of Sierra Santa Catarina, the site directly serves 28,000 inhabitants in urgent need of recreational spaces and water. 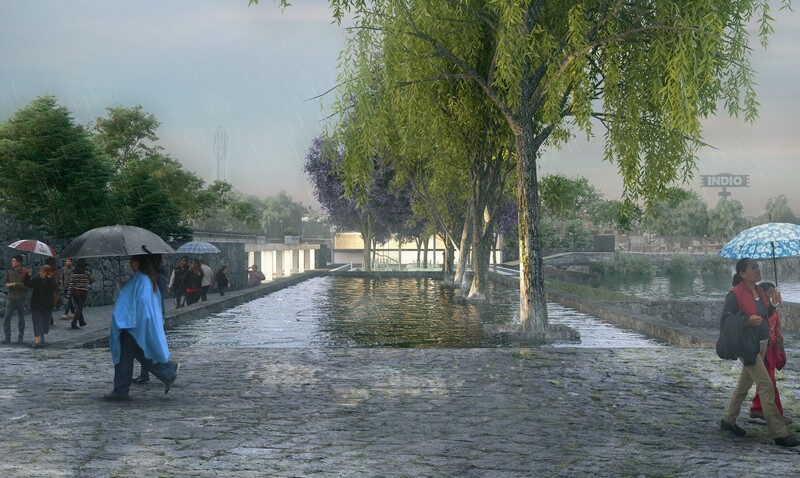 By removing the borders and placing a transparent permeable fence, the place becomes a sustainable water management landmark located in an important crossroads. It fosters street life by adopting Paraíso Street and turning it into a shared mobility thoroughfare with commerce, reducing crime in what the community detected as the most dangerous street in the area. 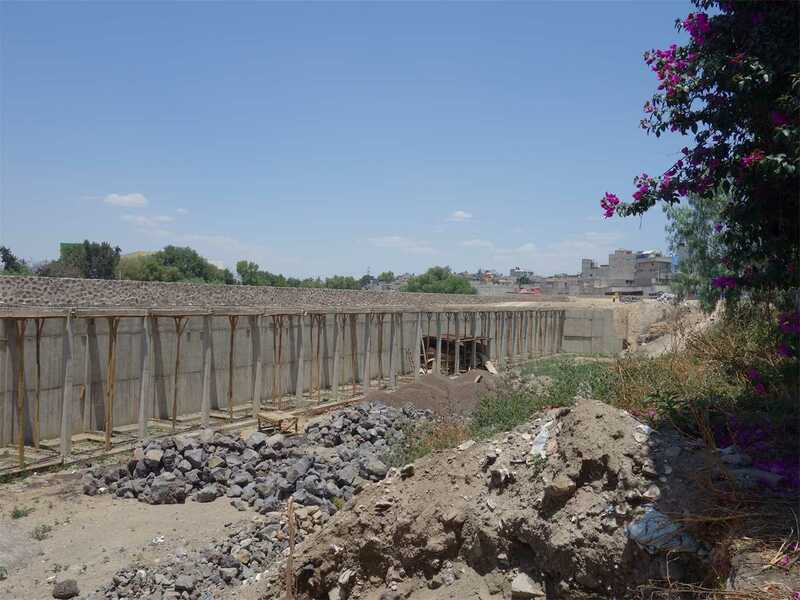 A concrete structure is being built to accommodate cisterns as part of the water management system. Two pre-existing infiltration basins are integrated into the project – increasing their capacity by one third. 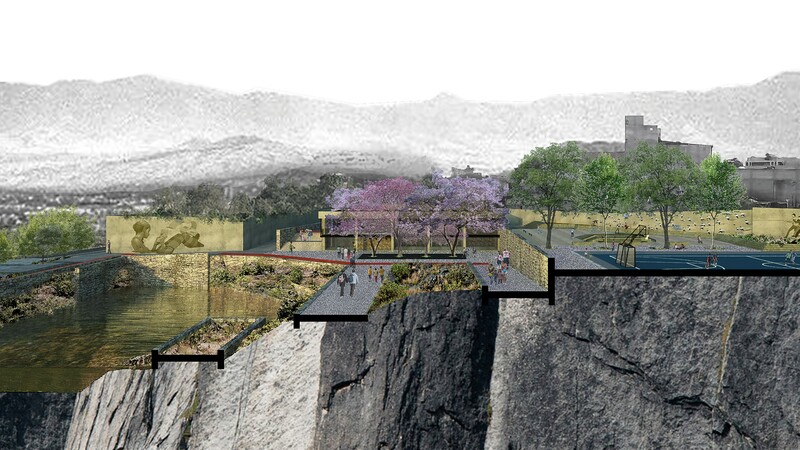 Cross section: Molding the site through a strategy of stone retention walls and platforms. 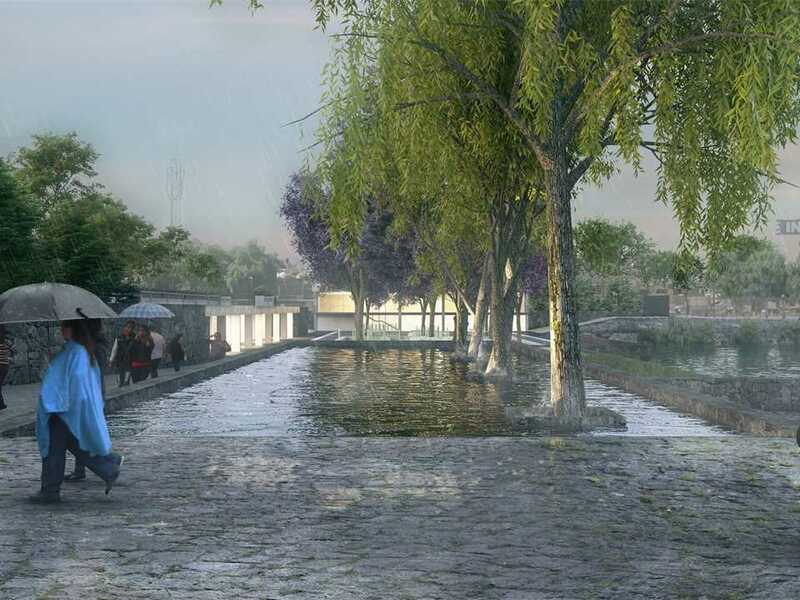 Terraced platforms on the four-hectare parcel of land are ready to be turned into recreational space open to the public while operating as water management system for the entire neighborhood. From fenced-in wasteland to a playground including basketball and volleyball fields, an open-air theatre, library, cafeteria and public toilets – above a system of pipes and basins managing roughly 70,000 m3 of run-off water a year. An ambitious project to transform public perceptions of water, and to embed civic amenities into water infrastructure is underway in Mexico City. The Global LafargeHolcim Awards Gold winning project will improve conditions in the dense urban fabric by forming a greenbelt that doubles as water management infrastructure. 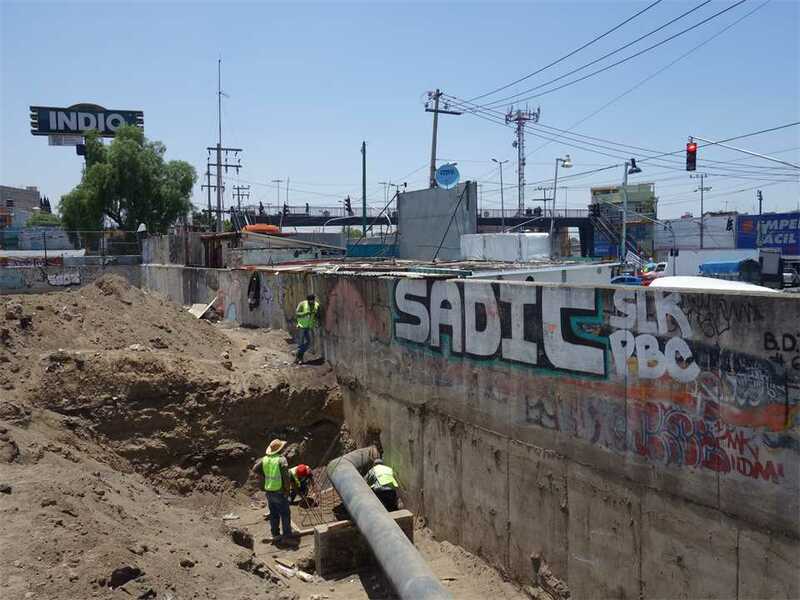 Hydropuncture consolidates an alternate, decentralized, and sustainable water management system for Mexico City. Work is progressing according to plan. 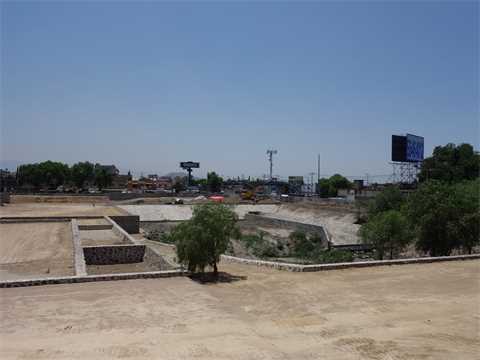 Basic earthworks are completed and the series of terraced platforms and retaining walls of volcanic stones are in place. Work is progressing according to plan. 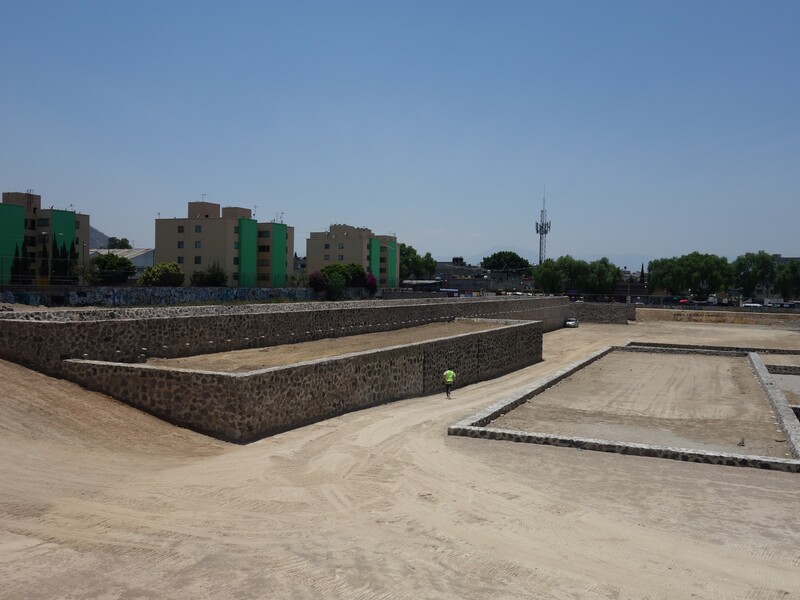 Basic earthworks are completed and the series of terraced platforms and retaining walls of volcanic stones are in place. In the next six months, the buildings will be erected and a great number of trees and plants added to create both a recreational area and a wetland system to naturally filter storm and wastewater. 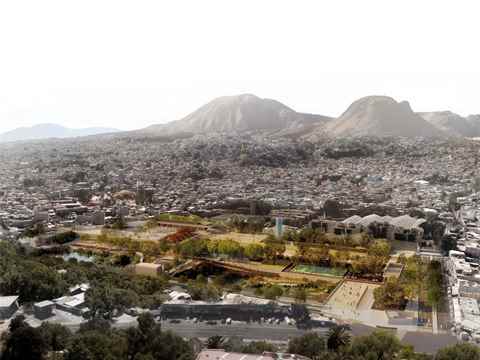 The earthwork underway takes into account the geology and history of the Mexican capital. Built on an endorheic basic fed by 47 rivers, Mexico City is at the center of a 1,100km square lake system. 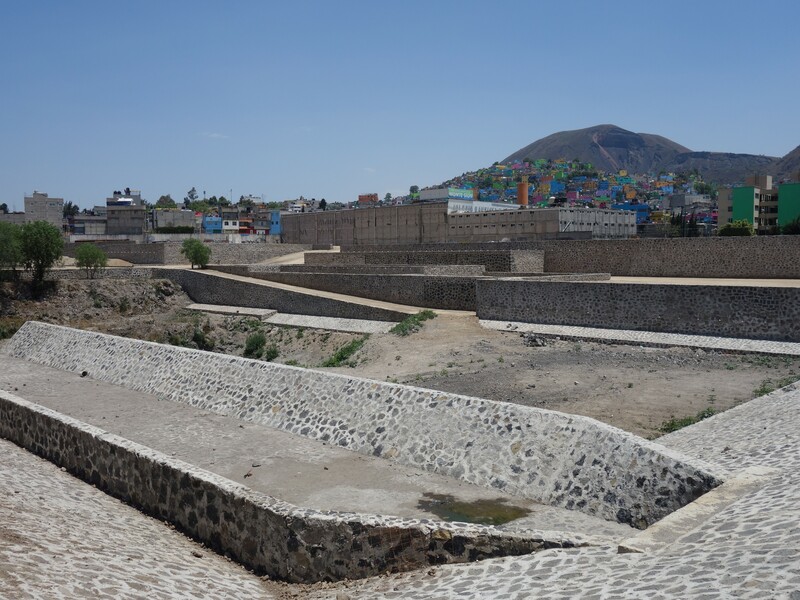 The Aztec city of Tenochtitlán was founded in 1325 and used a grid of canals and floating earth platforms (chinampas) to permit the natural flow of water. After colonization, the city was transformed into an earth and stone grid that covered the canals and increased flood vulnerability, eventually leading to the draining of the lake system by artificially perforating the basin. Today, the megalopolis of 22 million inhabitants still struggles with floods and the supply of drinking water. To make matters worse, the city is vulnerable to earthquakes. The project includes strategies such as rainwater harvesting; natural infiltration; runoff retention; reforestation of the hillsides; stream and river remediation; and the transformation of wastelands into landscape infrastructures. 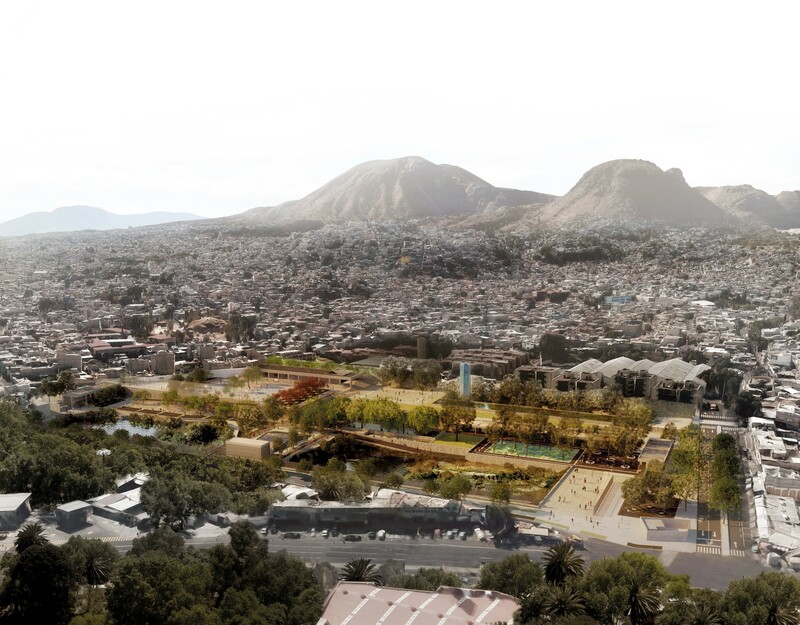 Starting with Parque Hídrico Quebradora, the approach led by Manuel Perló Cohen, researcher at Universidad Nacional Autónoma de México (UNAM) and Loreta Castro Reguera, design director at Taller Capital, sets a new paradigm for the future design of public urban spaces in the country.